28% of academic staff in UK universities are non-UK nationals (16% EU and 12% non-EU), as are half of PhD students. How mobile is the UK research workforce? International mobility has shaped the UK research landscape. Researchers travel from the UK to work in the EU and the rest of the world, and foreign researchers, including those from the EU, come to work in the UK. How international is the UK research workforce? Over a quarter (28%) of the 194,190 academic staff in UK universities are non-UK nationals (Figure 1). Recruitment from the EU makes up a significant part of this. In 2014/15 there were 31,635 EU nationals (excluding UK nationals) working in UK universities, 16% of the total, and 23,360 from outside of the EU, 12% of the total. 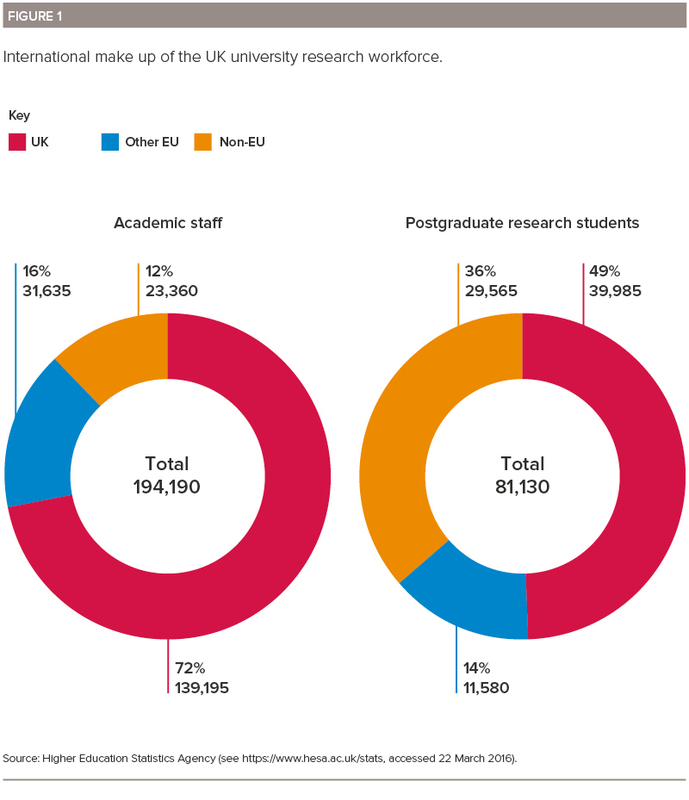 PhD students also make up a large proportion of the UK’s research population, with a total of 81,130 active in UK higher education institutes in 2014/15. 14% of PhD students are non-UK nationals from the EU and 36% are from outside the EU – half of the doctoral students in the UK are foreign nationals. The international profile of the UK’s academic workforce reflects the ability of the UK to attract talent from overseas and this supports the UK’s scientific excellence. UK institutions with greater proportions of foreign researchers and researchers with international experience scored more highly in the recent Research Excellence Framework, which assesses the quality of research in higher education institutions. How much do UK-based researchers move overseas? 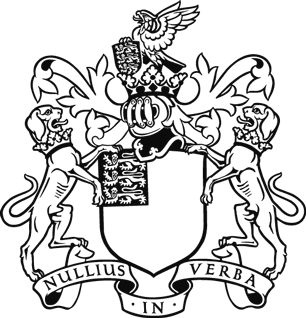 Throughout this report, the term ‘UK-based researchers’ refers to researchers who have stated an affiliation with a UK institution. By analysing the publication record of such researchers we can see how much these individuals have moved internationally. Using data from publications in this way means that non-UK nationals who are based in the UK are included in the analyses and, as shown in Figure 1, these individuals represent a considerable proportion of the total. The UK has a highly mobile researcher population. Almost 70% of active UK researchers in the period 1996 – 2011 had published articles for which they were affiliated with non-UK institutions, indicating that they had worked abroad at some point during that period. Some of those researchers may have moved for relatively short periods, but UK-based researchers also move for longer periods: 21% of UK-based researchers worked abroad for a period of two years or more during the same period. Comparing this to other scientific nations, only Switzerland has more internationally mobile researchers in its workforce, with 84% having worked outside Switzerland between 1996 and 2011, and 25% having worked overseas for a period of more than two years. By contrast, 60% of Japanese and 71% of Chinese researchers did not publish a paper affiliated with an overseas institution during this period. Almost 70% of active UK researchers in the period 1996 – 2011 had published articles for which they were affiliated with non-UK institutions, indicating that they had worked abroad at some point during that period. How much do UK-based researchers collaborate internationally? 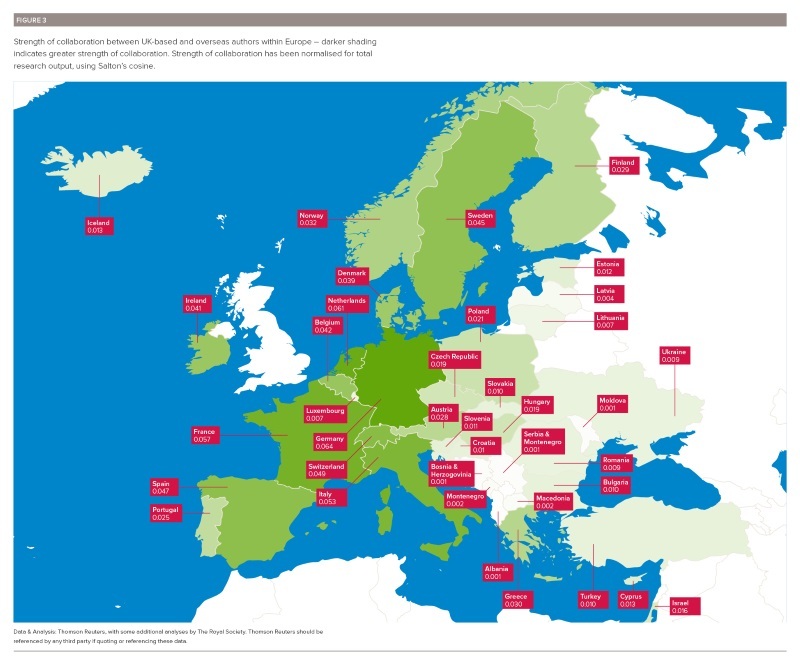 An increasing proportion of UK research is published with partners across the world, and EU partners are involved in an increasing share of this work. In 1981, about 90% of research papers by UK-based authors included only UK-based authors, whereas by 2011, over half of the UK’s research output was the result of an international collaboration (Figure 2). This proportion has been rising steadily. In 2015, UK-based researchers published over three times as many papers as they did in 1981. The number of papers with only UK-based authors increased from 29,017 to 47,308, the number of internationally co-authored papers increased from 3,632 to 67,707.
Who do UK-based researchers collaborate with? 37% of the 1.6 million research papers published by UK authors from 2005 to 2014 were internationally co-authored. The US is the UK’s top collaborative research partner (Table 1A); of all the research published by UK researchers in this period, 12% was with a US co-author. However, the USA’s total research output is much greater than that of the other countries listed in Table 1A. To account for this fact, we applied Salton’s cosine, a method that can be applied to normalise the data by the volume of output for both partners, giving a size-independent indicator of the strength of collaboration. Once this is applied, the strength of collaboration between the UK and Germany is shown to be greater than that between the UK and the USA (Table 1B and Figure 3). It was not possible to compare the UK’s collaboration with the USA and Europe as a whole, but Table 1B shows that many European countries are among the UK’s top collaborators, accounting for seven of the top ten positions. Top 20 collaborative partner countries for UK authors, 2005 – 2014. Note: individual publications may be counted in more than one row, where there are multiple co-authors. Data & Analysis: Thomson Reuters, with some additional analyses by The Royal Society. Thomson Reuters should be referenced by any third party if quoting or referencing these data.